If Abraham’s Love Test was designed to reveal to us the depth of our Heavenly Father’s love for us as I believe it was, we must also see the test from Isaac’s perspective. The three days journey to the “hill far away” (Mount Moriah) seems to have been made in silence. There is only once recorded conversation between the Father and the Son. Genesis 22:7-8 says, “And Isaac said to his father Abraham, my father! And Abraham answered, here I am, my son. Isaac said, I have the fire and the wood, but where is the lamb for a burnt offering? Abraham said, God will provide for himself the lamb for a burnt offering, my son. So they went both of them together.” Yes, the Father led the Son up the hill of Calvary and offered His own son as a sacrifice for our sin. Isaac was a young man, full of strength, and could have rebelled against his 120 year old father. But he obeyed! 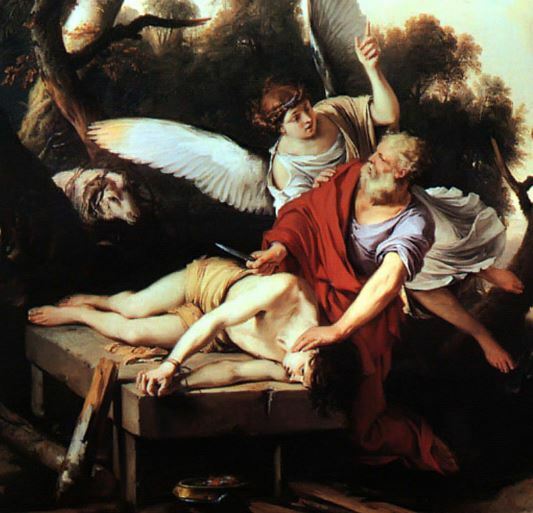 Imagine the scene of Isaac crawling up on the altar knowing his father’s intention. Could there be a stronger picture of the son’s faith in his father. Paul teaches us that Jesus fulfilled this picture of Isaac for us. It’s hard not to think that Paul had the story of Isaac on Mt. Moriah in mind when he wrote these words to the Philippian church and to us: He says that Jesus “…emptied himself, by taking the form of a servant, being born in the likeness of men. And being found in human form, he humbled himself by becoming obedient to the point of death, even death on a cross” (Philippians 2:7-8). Jesus could have called a legion of angels and delivered Himself from the cross, but He chose to surrender to the father’s will. Both Isaac and Jesus were sons of promise. The angel had announced to Abraham that he and Sarah would bear a son. Likewise, the birth of Christ was announced beforehand by an angel to Mary and Joseph. Even the very names of these boys were given before conception. Both were born miraculously. God “tinkered” with a woman’s womb to cause a supernatural conception in both cases. Both Isaac and Jesus were called the only begotten sons of their fathers. Both Isaac and Jesus carried the wood up the hill on their own backs. It was the wood on which they were to be sacrificed. Both were to be offered as a burnt offering for sin. Both willingly allowed themselves to be placed on the wood they had carried on their backs to the top of the mountain. Both became obedient unto death. Both Isaac and Jesus had fathers who were willing to sacrifice their sons “on a hill far away.” It was the same hill! That’s why Genesis 22 keeps emphasizing the particular site of the mountain chosen by God (vv. 2, 3, 9, 14). “In the Mount of the LORD it shall be provided.” On the Mount of the Lord it was provided! The sacrifice for our sins!